Earlier this year, Deepika Padukone had confirmed that she was paid more than her Padmaavat co-stars Ranveer Singh and Shahid Kapoor without disclosing the amount. Newly weds Deepika Padukone and Ranveer Singh found their places in the top 10 positions on the 2018 Forbes India Celebrity 100 list based on the estimates of their entertainment-related earnings calculated from October 1, 2017 to September 30, 2018. And going by their individuals earnings, there's no harm in declaring that Mastani Deepika earned more than her Bajirao Ranveer thanks to the commercial success of Padmaavat and her brand endorsements. While Deepika became the first woman celebrity to find place in the top five with earnings of Rs 112.8 crore, placing her firmly at rank 4, making her the highest paid actresses in India, Ranveer stood at rank 8 with earnings of Rs 84.7 crore. 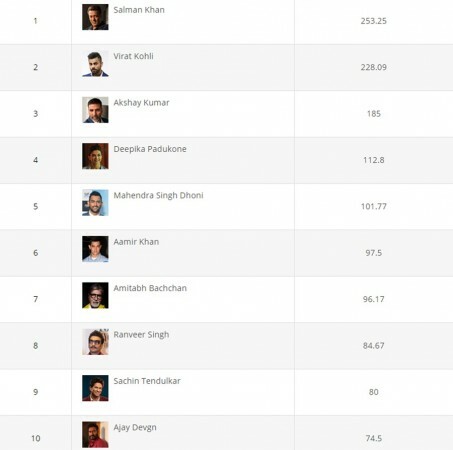 Deepika is the only woman to break into the top five on the Forbes India Celebrity 100 list. Earlier this year, Deepika had confirmed that she was paid more than her Padmaavat co-stars Ranveer Singh and Shahid Kapoor without disclosing the amount. However, reports stated that Deepika took home a whopping Rs. 13 crore as remuneration for Sanjay Leela Bhansali directed period drama, while Ranveer and Shahid shared equal digits close to Rs. 10 crores respectively. Meanwhile, Bollywood superstar Salman Khan, 52, cemented his place in the top spot thanks to the commercial success of his movies Tiger Zinda Hai and Race 3. His earnings were backed by endorsements of several consumer-facing brands, and constitute 8.06 percent of the total earnings -- Rs 3,140.25 crore -- of the top 100 celebrities for the year, read a statement from Forbes.